"Inspiration - Do You Need Some Help With Your Enemies?" Are you looking for inspiration? Haven't you discovered that the more you try to live for Jesus, the more the devil sends wolves and enemies into your life? Have you felt like no one with power really cares about you? Do you feel like there is no real direction being given to your life? Is your soul running on empty? Do you fear what might happen to you, in these dangerous times, in which we live? Are you just making it from pay check to pay check? Do you sometimes wonder how your life will end up? If you answer "yes" to any of these questions, I have great news and inspiration for you! God really cares for you. In fact, He is like a great shepherd who protects his sheep from wolves and a great host who protects his guests from enemies. 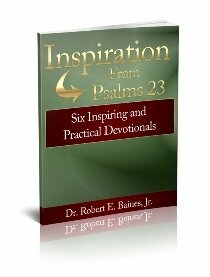 You need to order your free copy of my short devotionals based on Psalms 23. This material will help you to stop focusing on your enemies and spend more time focusing on being a sheep and guest of God. More important than my seminary education and twenty years of pastoral experience, the inspiration found in these devotionals grow out of my personal walk with God. You owe it to your self to download it today. - You will be inspired to trust that God will see you through, in spite of the influence of your enemies. You are not destined to stay in the valley. You are going through. - You don't have to wait for shipping and handling. The 10 page (PDF) free devotional can be downloaded in minutes. - You will be added to my weekly mailing of the Christian Living Newsletter. This is a weekly newsletter of free quality and helpful Christian living information. - You will receive inspiration in the weekly newsletter to stay encouraged and focused on living according to God's will. Warning: If you don't take advantage of this free offer, enemies will keep on trying to steal your joy and peace of mind. You don’t have to be as stressed as you are. Don't you owe it to yourself to have some inspiration in dealing with your enemies? Input your name and email address above, now, before the devil talks you out of it.